Playing Rugby League since “God was a Boy”: How old is Stanley Gene? He claims to be 34 but may well have been born just after World War II. His true age is unknown because no one has ever seen a birth certificate for Papua New Guinea and English Super League utility Stanley Gene. But the mystery man is ready to become a World Cup cult figure. Former Wigan forward Bryan Fletcher claims Gene is 45 years old while Jamie Lyon, the ex-St Helens star, reckons Gene is at least 40. On-line encyclopedia Wikipedia boldly states Gene could be anywhere “between 32 and 58”. He is almost certainly the oldest elite footballer of any code in the world today. The accompanying photo looks like a man aged about 50. 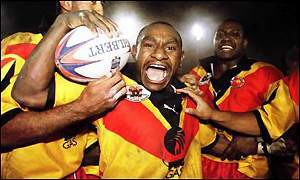 So just how old is the Kumuls cult hero? “I’m 34 – eleventh of the fifth ’74 – I’m not telling you fibs,” Gene told The Daily Telegraph yesterday. But those that have played with and against Gene in England, where he has played with Hull KR, Hull, Huddersfield and Bradford, are adamant he is a whole lot older. Even PNG rugby league chairman Albert Veratau admits he has never seen Gene’s birth certificate. Asked did he look older than he was, Gene said: “People say that. PNG people look older in the face. When I come to New Zealand and Australia and meet people my age, I think they are a lot younger. Stuart Raper, who coached Wigan and Castleford, remembers Gene well. “Facially, I reckon he’s 41,” Raper said. “I was over there in 1997, 11 years ago, and I reckon he was 30 then. I’m not kidding,” Raper said. Another confused about Gene’s exact age is Veratau, who thinks his player is in his 30s but is unsure. Asked for Gene’s age, Veratau: “To be honest I have absolutely no idea. He could have been on the Kokoda Trail. David Furner, who played against Gene during stints with Leeds and Wigan, did not want to be offensive. “I can’t tell how old he is but he’d have to be 38 or 39 – and I’m being kind to him,” Furner said. Manly’s Lyon, the former Man of Steel winner, also had an opinion. “He’d have to be pushing 40, if not a tad over. He’s been around a while now Stanley,” he said. ~ by Tavurvur on October 16, 2008. Stanley was playing when Nelson was a cadet !! !